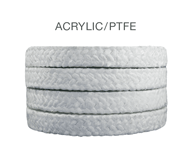 Teflon® impregnated, acrylic yarn with unique break-in lubricant. Single yarn encapsulation for superior protection from chemical attack. Good chemical resistance. Excellent in medium acids and alkalis, petroleum and synthetic oils, steam, aromatic and aliphatic solvents and dry gas applications. Where a clean “white” non-contaminating packing is preferred. Rotating equipment – general service applications, agitators/mixers, pumps and valves.